Not a fan of the traditional wedding cake? These dessert options are so tasty, your guests will forget all about cake. 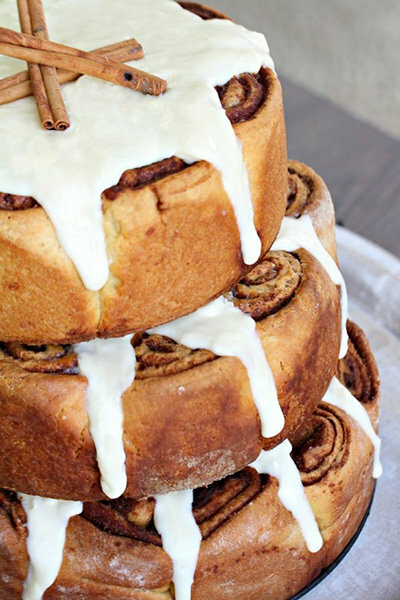 Cinnamon buns aren't your typical wedding fare — which is why your guests will love this unexpected choice. Transform your favorite dessert into a sweet dessert shooter, featuring layers of pastry and cream in a shot glass. Related: Wedding Bar Guide: How Much Alcohol Do You Need? Perfect for a summer wedding, create a grab-and-go ice cream stand. This traditional French dessert consists of cream puffs and caramel. Instead of cutting the cake, drizzle syrup over your waffle stack together. Feature your favorite family recipes in an elaborate cookie buffet. Cut into tiers of soft-baked cookies. These adorable cookies are designed to look like mini wedding cakes. The ultimate comfort food goes upscale with milk and cookie shots. Pile up these cookie sandwiches to create a cookie cake. This French dessert has taken the world by storm; make them even more fitting for a wedding by displaying them on a tiered platter. Dig into a slice of your favorite pie together. A stack of mini pies lets each of your guests grab his or her favorite flavor. A pie-on-a-stick is deliciously portable. This grab-and-go dessert is perfect for a wedding — your guests can keep on dancing while satisfying their sweet cravings. Photo courtesy of Elegant Affairs, Inc.
Light and refreshing, fruit tarts are a crowd-pleasing dessert option after a hearty meal. Top your doughnut tower with a cake tier so that you can still have that cake-cutting moment. For a fun treat, serve bite-size doughnut holes on skewers. Cupcakes are the most popular wedding cake alternative; give your dessert display a whimsical touch with unique décor. Fancier than cupcakes but more portable than a cake, these mini cakes are the perfect compromise. For an elegant take on this fun dessert, display your cake pops on a tiered platter. A create-your-own-s'mores bar is a crowd-pleasing option any time of year. Feature your favorite childhood treat in a wedding-worthy way with a cake make of Rice Krispie treats. Guests will love this nostalgic treat! Gather a variety of candies that match your wedding color scheme, and invite each guest to fill a bag to take home.